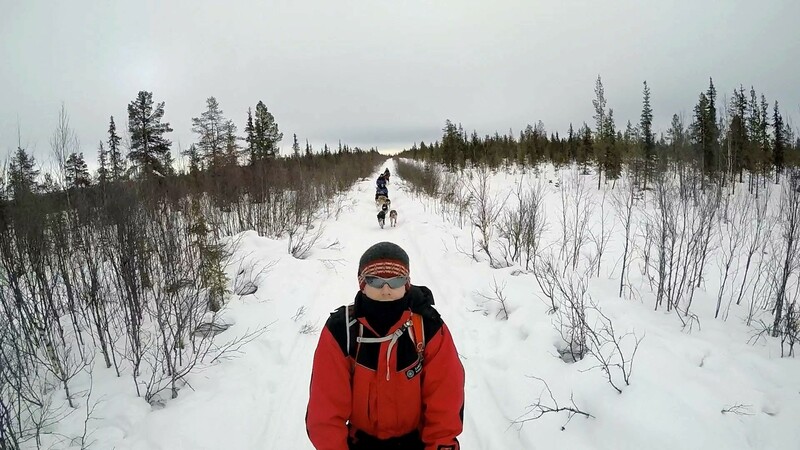 On the 15th March this year a team of fifteen air cadets and staff embarked on a 9 day expedition to Kiruna in the north of Sweden, deep in the Arctic Circle wilderness. After almost two years of fund raising and anticipation we were finally on our way to Stockholm the capital city of Sweden. From there we were due to catch the night train all the way to the North of Sweden, a distance of 1450km (950 miles) which was an experience in itself; once settled into our cosy 6 man sleeping berths we began our 17 hour journey to Kiruna. Arriving in Kiruna later the following morning, we were greeted at the platform by our expedition guides, along with more snow than most of us had ever seen! We travelled along the icy roads into the beautiful forestry of Sweden, arriving at our tour guides camp. 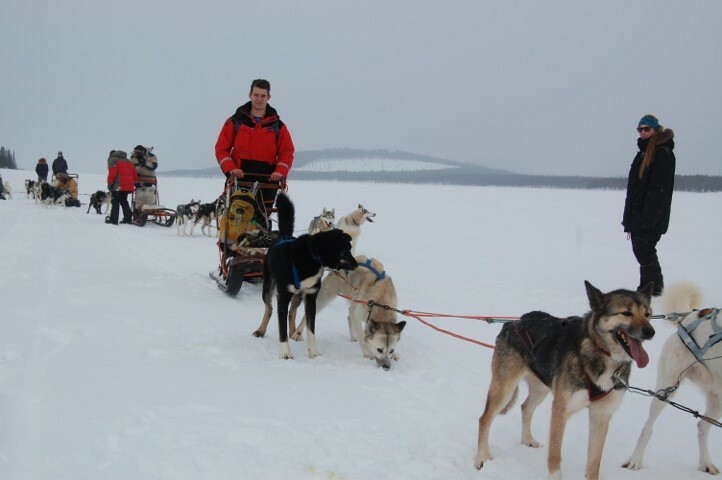 Our expedition was planned to be seven days of dog sledging around the Arctic Circle, but it was made clear to us when we arrived that it would have been difficult as the dogs on the camp were ill with a canine flu epidemic and that their work time was limited by the local vets. Despite this, our team leader Christian Wilkins along with our tour guide said they would still get some sledging done along with various arctic survival skills that would be taught in the remote wilderness. Meeting our tour guide Marcus and his team was our first contact with the Swedish people; he gave us a full briefing and itinerary as to his expectations for the week; we were also kitted out with thermal coveralls, lined artic boots and thick mittens to combat the -15 deg C temperatures before we moved into our base camp the next morning. The next morning we travelled even further north. We had to leave our mini buses and carry our kit a few kilometres through the snow into our basic campsite; this was our home for the next 7 days. With no heating, electricity or running water we had to provide for ourselves. We had to dig out a fire pit and use the snow to make a wind break and were instructed how to gather materials around the campsite. 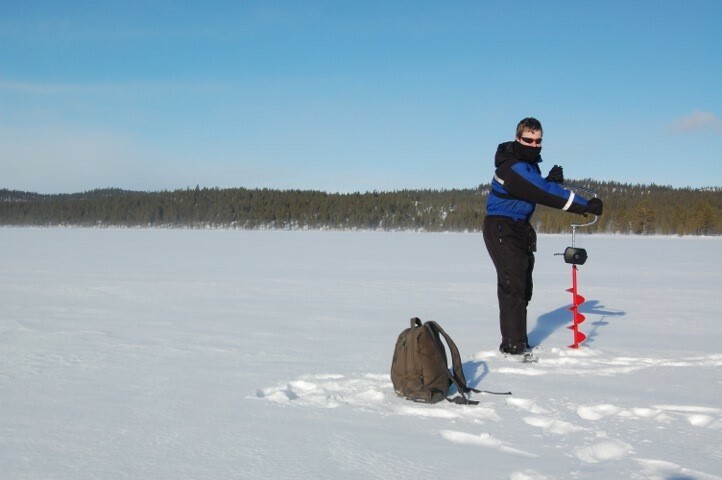 Being self sufficient was one of the great experiences of our expedition as we really were in the middle of nowhere, gathering our water and ice fishing from a hole in the nearby frozen lake which required the use of 1 metre long 5 inch diameter drill to bore through the ice. Wood had to be gathered and chopped to supply the main cooking fire, as all meals would be taken ‘al fresco’ out in the open, any temperature , snowing or not! After we were settled into our camp we began to learn from our guide Marcus a series of survival techniques in the arctic wilderness. Staying in the camp that Ray Mears himself trained in, we learned about the different way to make shelters and the right trees to use for firewood. One of the main activities was building Igloos to live in. We split into two teams and started building up igloos to fit about 7 to 8 persons in each. We left the igloos over night to freeze, dug them out from the inside and took turns in sleeping in them throughout the week. 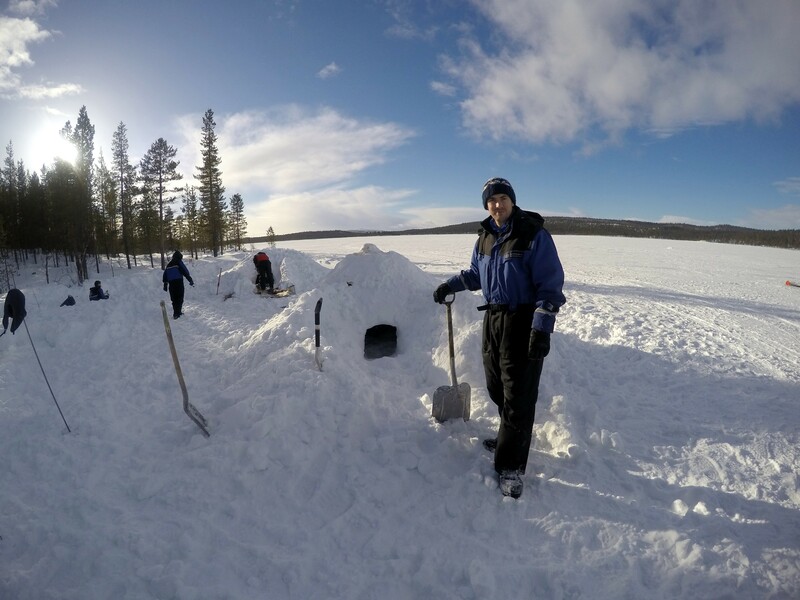 That was one of the best experiences some of the team said they’ll bring back, sleeping in an igloo on a frozen lake with the spectacular Aurora Borealis (northern lights) overhead almost every night. Other activities we did included orienteering through the thick snow (3 feet deep) using snow shoes which we found very physically demanding; Marcus also showed us how to make our own snow shoes with sticks and twine. Another enjoyable but physical activity was a 12 km navex cross country exped skiing over and around lakes Väkkäräjävi and Piettarasjärvi, which took a lot of bumps and bruises to get used to with the thin skis used for long treks on irregular ground. 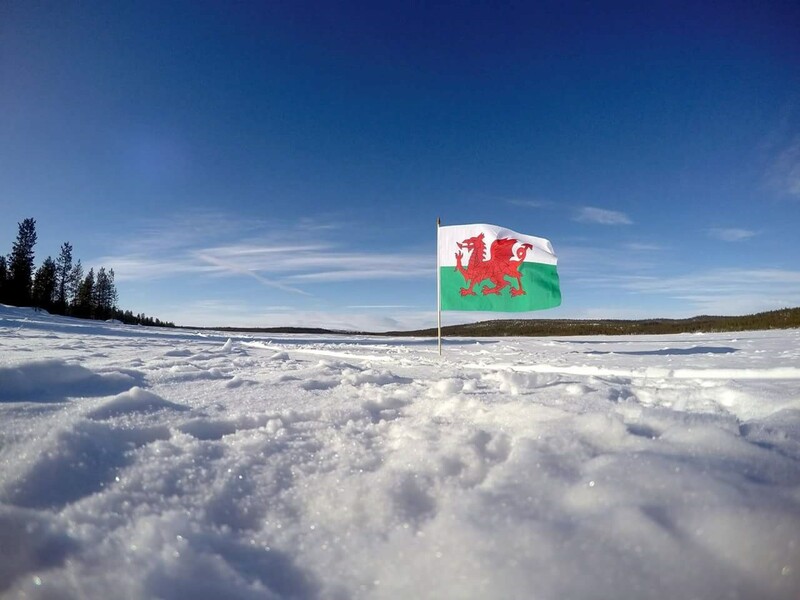 In summary, a truly wonderful 9 day experience where all cadets and staff combined as a team, wherein everyone was pushed to their limits, learning new skills in a demanding and unforgiving but beautiful environment that is potentially one of the last unspoilt wildernesses in Northern Europe. Our thanks go to the Ulysses Trust and the RAF Charitable Trust for supporting this expedition. Dog sledging gave us another taste of Arctic life as we were shown how control the sledges and to give instructions to the dogs and keep them happy as they worked hard for us. 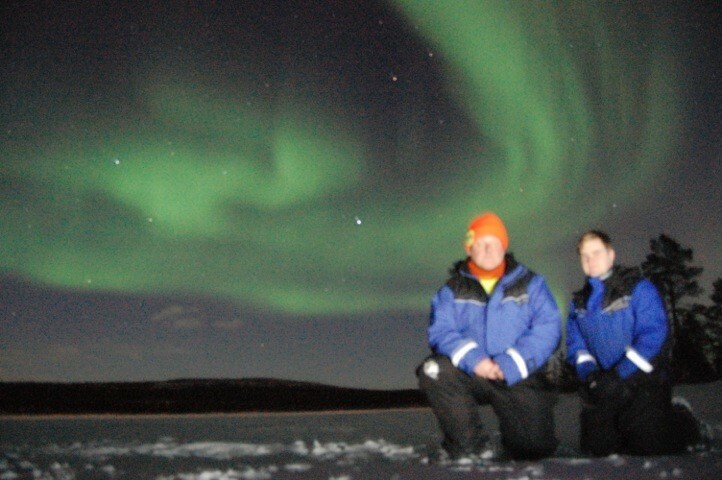 Wg Cmdr Mike Stones and Sgt (ATC) Geraint Lawrence enjoy the Northern Lights over lake Väkkäräjävi on day 4, the 3rd and most spectacular sighting. 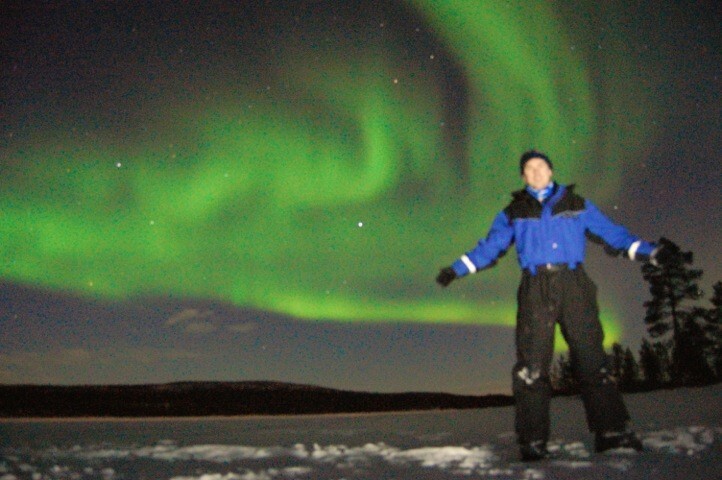 Flt Lt Christian Wilkins in front of a spectacular Northern Lights display. 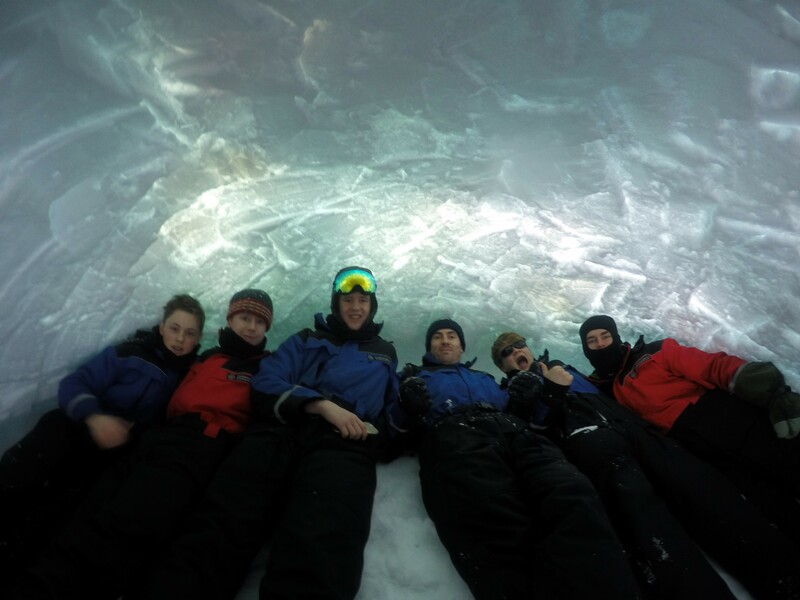 Cadets and Staff pose inside the igloo once completed. Each team member spent a night in the igloo. 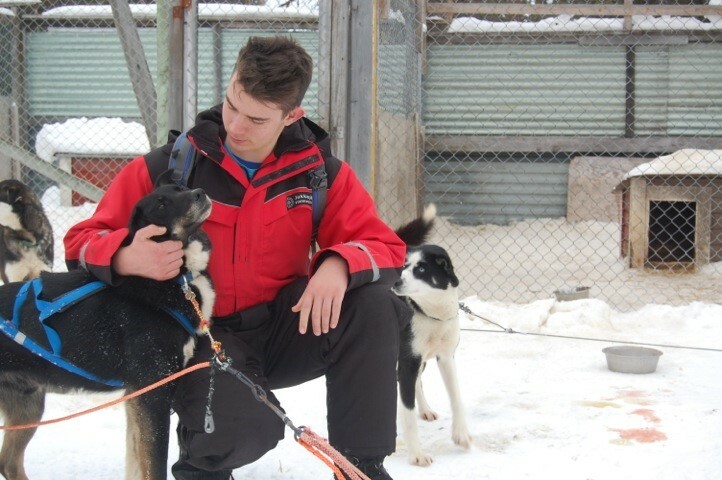 Cadet Sgt Kieran Dunstan getting to know his dog team at the base site. Cadet dog teams rest up during sledging expedition. 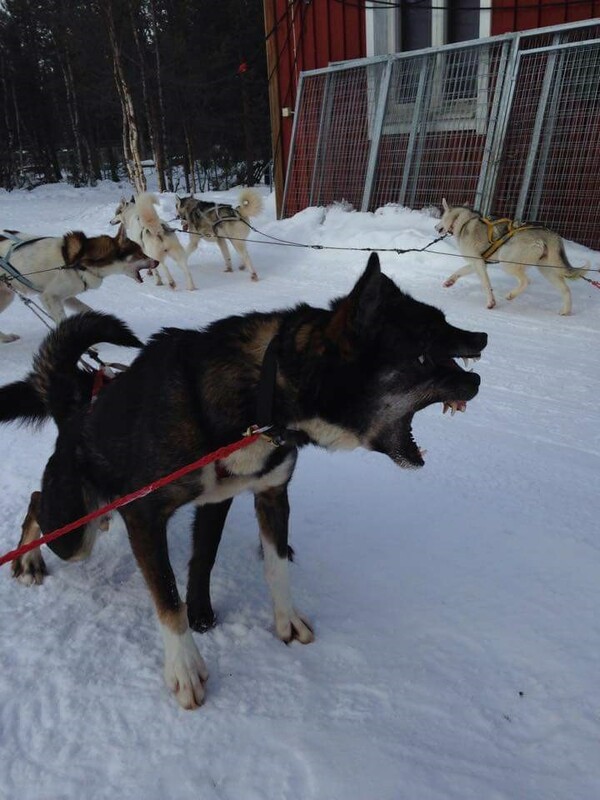 Watch out, they might bite!! We came to the Arctic Circle, we saw, we learnt and we enjoyed!! !